We are first and foremost an organization that is about raising charitable contributions, secondly we are an organization that sets skydiving records. Our main mission is to raise money and if we are able to set new skydiving records, that is an added bonus. It really is all about the money! The contributions that are raised go directly to individuals who need mammograms and other services and may not be able to pay for these life saving procedures. Early detection is critical in the successful treatment of breast cancer. If we can save the life of just one beloved mother, grandmother, sister or aunt, we have changed the course of many other relatives who love, adore, and rely on that family member. It is truly all about saving lives and there is no amount of money that can replace a loved one, but your charitable contributions can change the destiny of entire families. 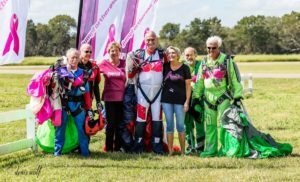 Jump For The Rose has adopted a “no jumper left behind” vision where we can create a relaxed no-fault learning environment for men and women skydivers. How do we differ from most other skydiving record attempts? Our mission is to teach, empower, and equip those young up-and-coming jumpers throughout the country who need it so that they, in turn, can have an opportunity to learn big way safety and big way skills in low key learning environment. If we set some records in the process, that is an added bonus, but we are truly about what our motto states: Skydive-Have Fun-Give Back! Jump For The Rose is a beacon of light in a dark reality called cancer; JFTR is committed to continuing to shine that light in any and all areas where we are able! We have come a long way in improving our ground crew, in fund-raising, and in early planning, that we are positive that with a little forethought, we will be able to handle any issues in a positive and productive way for the events and for the jumpers that have worked so hard to come to our events. JFTR desires to provide the best possible support both in the production of safe and successful dives, and in the promotion of a productive environment which shows all events in the best possible light and in the true spirit of giving back to the sport. Jump For The Rose is not political. JFTR is not partial. JFTR embraces everyone from our sponsors, volunteers, partnering drop zones and skydiving facilities, staff members, world class organizers, seasoned jumpers, and new jumpers. We encourage male and female veterans of the skydiving community to join us in our mission of teaching and giving by jumping in our events and mentoring a new jumper, so that our sport continues to grow and we perpetuate the learning environment. All of us have had those mentors in the sport who we remember fondly because of the time and effort they put into helping us learn and improve our skills. We now challenge YOU, the veteran jumper, to join us in our continuing quest to Skydive, Have Fun, & Give Back! Let’s keep our wonderful sport that we all hold dear growing in members and improving in safety while we have a blast doing it. The true heroes of JFTR are those giving souls who are behind the scenes of our events making sure that things flow smoothly whether it be by lending a hand setting up tables, running errands, accounting for skydivers as they land, working a booth selling goods or helping with clean-up. There is much to be done at each event and we rely on the great people who have a heart for giving back to those in need. All of us at some point in our lifetime have probably known someone who has experienced some form of cancer. Unfortunately it touches too many lives, but when we pull together, great things can happen to continue the fight for a cure and for early detection.